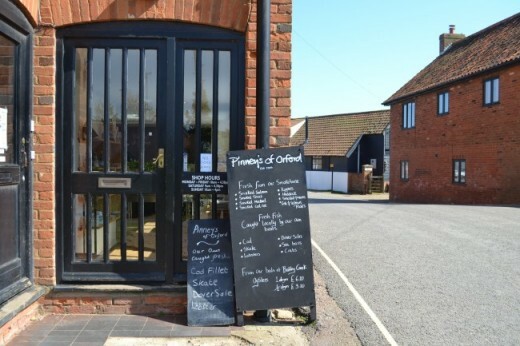 Our shop, down by the Quay at Orford is packed full of smoked delicacies, local produce and delicious ingredients. Here you will find the full Pinney’s range of products, smoked in our smokehouses down by Butley Creek, as well as a Fresh Fish Counter where you can purchase daily catches from our fishing boats. The catch varies with the seasons so if you are looking for anything in particular please sign up to our ‘What’s in season?’ E-Newsletter which means we can keep you informed. The frozen counter invites you to stock up on home produced cooking such as our crab cakes, potted crabs or angels on horseback and we also sell a great selection of carefully chosen pickles, chutneys, flavoured oils, jams, jellies, smoked olives and delicious accompaniments, that are the perfect addition to a tasty lunch. Or, for a quick and easy solution to a light supper how about a warming soup or pasta sauce. Looking for a gift? Our Hampers make the perfect present for a real foodie. You either choose one from our luxury range or make your own selection for a really personal touch. We also sell Gift Vouchers which are redeemable both in the shop and up at our restaurant, The Butley Orford Oysterage. Whilst you decide on what to have for supper take time to browse our beautiful selection of artisan pottery and cards or take away a steaming Paddy & Scott’s coffee to enjoy down by the Quay. We look forward to seeing you soon but do remember that if you are pushed for time most of the products in the shop can also be purchased on-line and will be delivered the next day.